Today I am sharing a handmade card that was inspired by a card that I saw on Pinterest made with the Father Christmas stamp set from Stampin’ Up! I made this card with two different color combinations and also made a slight change to the layering of the card. 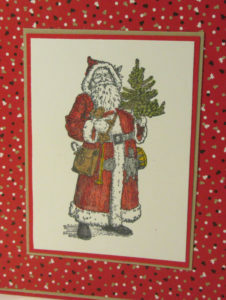 This card uses the Candy Cane Lane Designer Paper from Stampin’ Up! I love the color combination of Real Red, Crumb Cake and Chocolate chip in this patterned paper and couldn’t decide which card I liked better. 2 1/2″ x 3 1/2″ piece of Whisper White cardstock with Black Momento ink. I used alcohol markers to color in the image. The Whisper White piece is layered onto 2 pieces of cardstock. One is Real Red and the second is Crumb Cake. 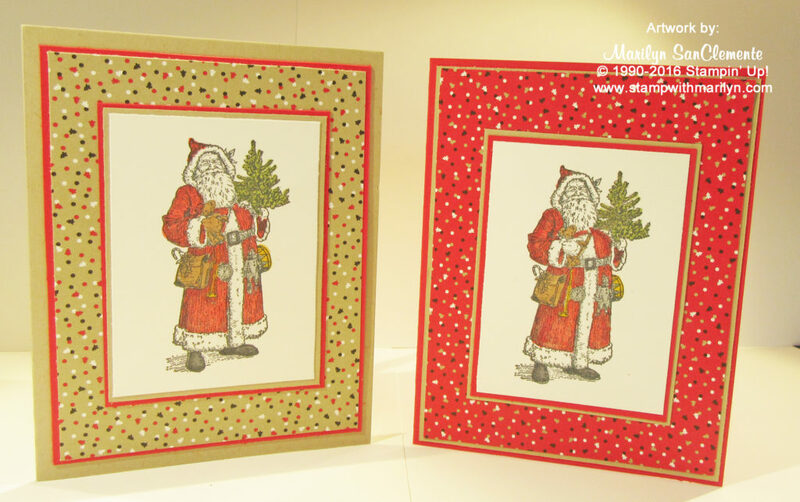 The layers are reversed on the two cards so the Father Christmas image pops with the pattern of the Designer Paper. Layering with 1/8″ of an inch makes a very narrow layer. If you want a wider layer, you would layer with 1/4″ between the layers. You may notice that the Crumb Cake Card has a slightly wider layer between the card base and the card front. I used a 3/8″ layer between the base of the Crumb Cake card and the Card front vs. a 1/4″ layer between the R eal red card base and card front. Father Christmas was colored with Alcohol markers. I used a Cherry Cobbler like color for Santa’s coat. His shoes are belt are colored with shades of gray. My goal was to bring out each of the toys that he is carrying with a different color. The bag is crumb cake and the tin man is also grays. The tree is colored with an old olive shade of color. Last, I used the Wink of Stella to color over the images to add some sparkle. You can’t really see the sparkle in the picture, but it really made the card pop! So which card do you like best?